Buy Togetherness & Time Together English $199.95 $179.96 Compatibility interpretation report! Buy Togetherness and get Time Together free. The Togetherness report offers a full compatibility interpretation of the basic natal composite chart of the two individuals involved. This interpretation describes the nature of the relationship itself. Relationship and compatibility astrology remains the single most popular form of astrology practiced around the world, but tracking the future of natal charts of two persons and combining the resulting list of indicators can be complicated. Wouldn't it be nice if there were a single chart that properly represented the relationship, one that could reveal how that special relationship changes day by day? Actually, there is a master astrologer, John Townley, that discovered it in the early 1970s. Called the Composite Chart, this chart represents both people in a relationship by combining the two charts (using the standard midpoint between each set of planets) into a single chart. Townley not only discovered how to use the composite chart, but he popularized it until today this chart is used by astrologers all over the world to track relationships of all kinds – romantic and otherwise. Since no one knows the composite chart like John Townley, we asked Townley to use his extensive experience and write a compatibility report for Matrix that would show not only the nature of the individual relationships, but also how that relationship changes over time, giving day-by-day analysis, but also charting out the overall future of the relationship over time. Actually, we had Townley write two separate reports, a natal analysis of the basic relationship, the Togetherness Report and a second report that tracks that relationship as it moves forward in time, called Time Together. 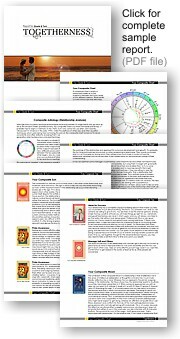 And, since many of your clients may not be astrologers, we offer these reports in a new easy-to-read visual format. Included in the report are a complete set of Astro*Images, tarot-like cards for astrologers that communicate directly with the mind, visually communicating the essence of an aspect at a glance. Of course, we have a complete written interpretation to go with the cards, plus keyword headers, and the usual astrological description. And Astro*Images can be turned on and off at your discretion. Select the location for the synastry chart. An average Togetherness report will run from 25 to 30 pages. Togetherness is a complete program that will function as a stand-alone or in conjunction with other Matrix programs. Reports in the Win*Writer Professional collection work within the same user window making it easy to produce multiple reports quickly and efficiently either individually or in convenient batches.